There are some terrific ways to cool the outdoors! Compare them next to each other on this page. Then get more information about the one (or more) that interests you most. Here are summaries of each outdoor cooling method with links to help you learn more about them. You can click on the titles or pictures to go to the main page of each section. The widest variety of cooling options fit in the category of outdoor shades. These can be the least expensive to use compared to other options because they require no electricity or water. But they are available in such an enormous variety of sizes and configurations, depending on your options they can end up being the most expensive of all. Cost is generally based on size, permanency, and the countless options of materials used. Because they require no electricity or water to run, outdoor shades can be the most portable of outdoor cooling methods. They can also be among the most permanent when they have no moving parts and are made of indestructible materials. It really helps to understand how shade moves and changes in order to make the most use of outdoor shades, and we have some excellent articles that can help. For more information, please read our pages: The Unique Benefits of Outdoor Shades, Understanding the Shifting Shade, How to do a Shade Audit, Shade Structures, Shade Materials. These work beautifully in even the most humid of conditions. Compare that with all evaporative coolers that work better the drier the air. These can cool in gentle breezes or still air. Oudoor fans don't actually COOL anything. Instead they make people FEEL cooler by moving the air around them -- the same way breezes make us feel cooler, but the outdoor temperature is just the same whether or not any breezes are blowing. Most often available in ceiling fans, but floor and wall mount fans are becoming more and more available for outdoor use. 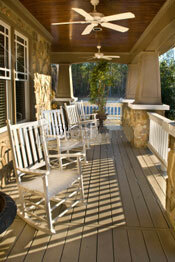 Postioning of outdoor fans can make a huge difference on how much cooling effect you'll actually get. Understand the humidity in your area to see how much cooling you can expect to get from these. Power for these is supplied with electricity, so care must be taken that they are operated safely outdoors. While it may seem that "outdoor" and "air conditioning" cannot possibly go together, there are times when air conditioning is the perfect solution. Most often used for special outdoor events such as weddings, fairs, conventions and expos, for example. Best for enclosed areas, such as tents, sheds or other outbuildings because this acts as a container for the cool air and a barrier for the warm exhaust air. They are the only cooling solution that cools and removes humidity, making them ideal to use around electronics. Can provide the greatest temperature reduction compared to all outdoor cooling methods. The Center for Disease Control (CDC) recommends these for prevention and treatment of heat-related illnesses. Portable air conditioners have hoses or nozzles that fit through windows or other openings to keep the warm air separate from the cooled air. Power for these is supplied with electricity, so care must be taken that they are operated safely outdoors. Misting Systems, swamp coolers and misting fans all belong to a class of outdoor cooling solutions called "evaporative coolers. "s They can cool well in any environment, but the drier the weather, the better these work. Compare that with outdoor fans that cool well in any environment but do better in humid areas. Understand the humidity in your area to see how much cooling you can expect to get from these. These can cool in gentle breezes or still air. The more powerful of these use pumps and motors supplied with electricity, so care must be taken that they are operated safely outdoors. These pumps and motors are part of a system that ensures a very fine spray, often called a mist or a fog. In ideal conditions these can cool by as much as 40°F or nearly 4.5°C. Systems are also available that don't use pumps. These give off a coarser spray that can get you a little wet, and generally won't cool as much, but are comparatively less expensive and simpler to set up and maintain. Work especially well in dry weather. Options to turn off evaporation controls moisture even in humid weather. Maintenance is simple but crucial to avoid odor, bacteria, etc. Swamp coolers, also called "desert coolers" use a fan to blow fresh air across a water-soaked pad. This gives you "wind chill" cooling plus evaporative cooling –	comparable to the cooling effect you'd get with a misting system or misting fan, but the water is contained in a pad positioned near the fan. They add humidity to the air, so are especially effective in hot, dry areas. Options to run with our without mist increases effectiveness in dry or humid weather. Much like swamp coolers, misting fans use a combination of evaporative cooling (the mist) and wind chill (the fan). These can cool in gently breezes and still air. Because they use electricity, care must be taken that they are operated safely outdoors. Low pressure "patio misting fans" don't use pumps. These give off a spray that can get you a little wet, and generally won't cool as much compared to high pressure fans, but they are simple to set up and maintain. High pressure fans give off a finer, cooler, drier mist but cost more. Outdoor fans, portable air conditioners, evaporative coolers and misting system pumps are available in battery-powered forms. These typically run off a car, recreation vehicle or tractor battery, or a small portable battery and are generally not as powerful compared to those that run on alternating current (such as supplied by a local electric company). They may not offer as much cooling, but they are more portable than methods powered by alternating current. So they can be used in places, such as campgrounds, beaches, parks and other areas where it can be hard, or impossible, to access a regular power source.